Inside we didn’t have too much time to talk to artists, but I had success in the dollar bins, filling out almost all of Mark Waid and Mike Wieringo’s Fantastic Four and picking up Grant Morrison’s Spawn issues, ¾ of his Swamp Thing, and two issues of Aztek. Excepting the British stuff, I just need the rest of Aztek, Kill Your Boyfriend, The New Adventures of Hitler, The Mystery Play, and Skrull Kill Krew and I’ll have everything he’s written. We made it to two panels, the Kirkman vs. Bendis and DC’s Superman panel. 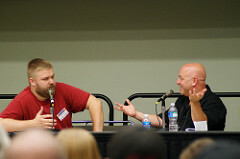 Robert Kirkman and Brian Michael Bendis were very entertaining and had a lot to say about the industry. 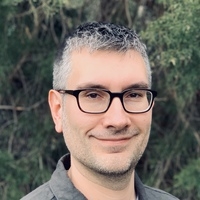 It’s unfortunate that business factors got in the way of Kirkman being able to share his trade paperback sales, but I agree with him that more people should focus on creating their own characters rather than working with DC and Marvel’s icons. Matt Fraction’s work on Casanova outshines his X-Men and Iron Man in every way. But Bendis had a good point that creators can do both. The Superman panel was less entertaining, but they made a good plug for Sterling Gates and Jamal Igle’s new run on Supergirl. Geoff Johns as always displayed his encyclopedic knowledge of the DC Universe but was outdone by Igle’s speech about why Superman is an inspiring character. James Robinson looked bored for most of the time. Fan questions ranged from the irrelevant to the inane. I did get to meet Scott Kurtz this year, having been blown off by him last year. He was friendly and only a little bit cocky.